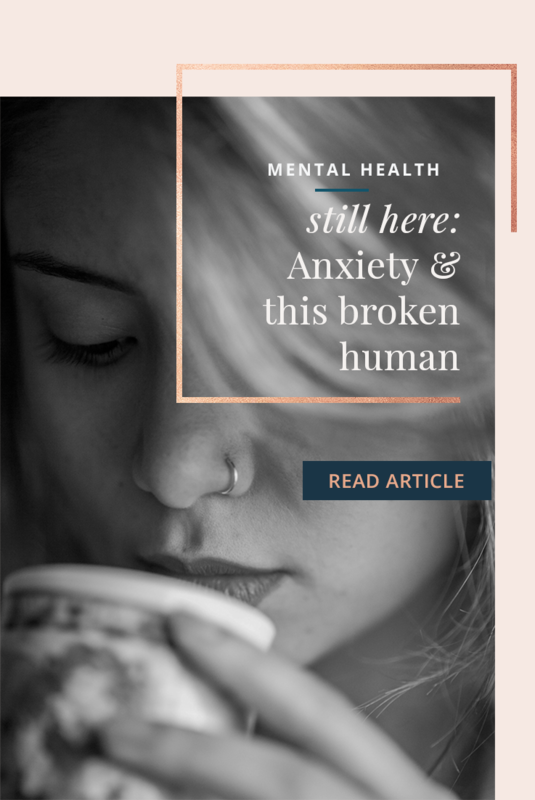 still here: anxiety and this broken human - It's a Story. I’ve been very open in the past about my anxiety. I have had low lying (and sometimes not so low) levels of anxiety for as long as I can remember. I’ve been a little bit open about my OCD tendencies and minor battles with depression. It’s so easy to be vulnerable when you have things under control. But this year my mental illnesses overtook me. This year I sank to a level I never imagined possible. 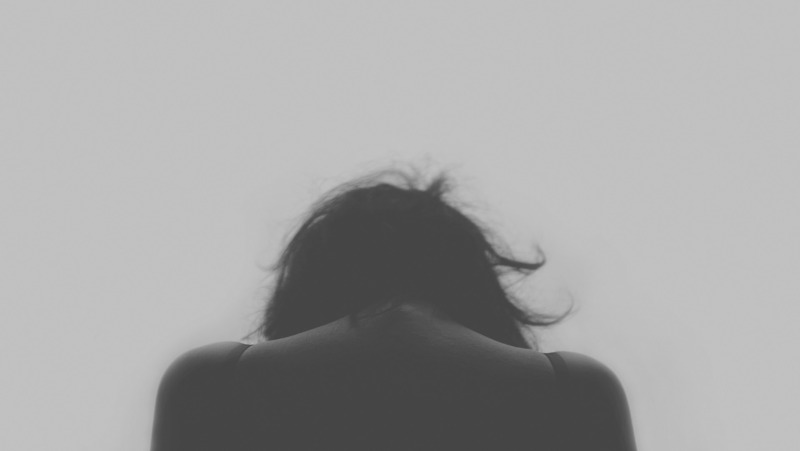 By October when I last wrote about my anxiety, I was having panic attacks constantly. And when I say constantly, I am not exaggerating. I tried Xanax as a temporary solution and hated it. So we tried a more natural route with supplements and a strict diet. I began improving a bit, and with the help of professors, extensions, and the heroes in the Student Disabilities office, I somehow passed my classes in the fall. But because of allergic reactions to Wheaton’s older buildings, by the end of the semester, I had moved campus apartments twice and was preparing to move into a new place in the spring. The second semester, I came back to Wheaton a bit more confident. I loved the classes I was taking. I seemed more stable. I could do this. But if you didn’t know, January through April in Illinois is hell on earth. Negative temperatures and constant wind. Weeks of overcast skies with no sun in sight. Days of nothing but freezing, drizzling rain. When the anxiety came back in terrifying waves, this time depression came with it. I had started to settle somewhat into my third home, but it wasn’t really mine. An apartment built for two people and stuffed with four is not ideal for someone with anxiety. I felt so trapped. For weeks, I would leave my apartment in the morning and just drive my little car to a nearby park. I would crawl in the back to sleep or do my homework. My car was the only space that was emotionally safe. The only space that felt like it was mine. The anxiety and depression got worse and worse. By March, I couldn’t attend any of my classes anymore. These were classes I absolutely loved and professors I so desperately wanted to impress. And I still couldn’t make it. One day in late March, a once independent, confident 21 year old woman, I found myself crawling across my bathroom floor, sobbing and screaming silently so my roommates couldn’t hear. The darkness and confusion in my mind was overpowering. I hung my head over the toilet, ready to puke from the stress of it all. I noticed a razor on the edge of the tub. Thoughts I never imagined I’d think came rushing into my mind. I barely managed to press call on my phone. I don’t remember the phone call at all, but I do remember the text after it. Please come get me. I’m so scared. My dad flew into town that week. The first few days with him are a blur. I remember being curled up in a hotel bed, clawing at my own arms desperate for some form of grounding, and sobbing. My mind felt dark and distant. When the attacks happen I can’t think straight or process. If you know me, you know that I love to strategize. I love to rationalize and find the logical solutions to every problem. Being unable to think straight or explain to anyone around me what was happening inside my glitchy mind was truly a form of torture. My dad stayed with me for the entire last month of the semester. He got me to a psychiatrist and then to my therapist. My therapist gave me strategies, my psychiatrist gave me medication. Over a month later, here we are. I’m writing from sunny Orlando. I’ve been on medication for 5 weeks, and I’ve improved radically. But as I recover, I realize that I don’t know who I am anymore. A part of me died this year. This year my whole life changed in so many ways. My path changed. My identity changed. I came so close to losing any fragment of faith I had. I know I have no right to question God, but it felt like betrayal. The result meant I stopped caring about the evangelical world I was in and started following what little faith I had left toward more life giving things. There is more freedom and grace and creativity and life in Christ than I had ever imagined. I have loved reading Catholic authors and quotes from saints. I have loved learning to see God in this physical world. The spiritual and physical are so intricately tied and oh my goodness, it’s painful and beautiful all at once. My faith looks different now. And honestly? Despite all the pain and all the trauma I’m carrying with me because of it, I’m… relieved. Wheaton College will always feel like home to me. But as much as I adore Wheaton, the combination of this mental illness while living and learning in the center of American Evangelicalism was suffocating. So, as of right now, I have decided not to return to Wheaton College in the fall. My body and my soul need a very long break. A break both from academics and from the intellectualized Christianity. A break to figure out this new Jaime. A break to restore my confidence in my own mind. I’ll still be living in Wheaton, working and enjoying the time rebuilding friendships that suffered so severely this year. A dear friend of mine battled anxiety this bad when he was my age. I thought I understood–I didn’t. I might understand now. He prioritized things differently than I would have, but I don’t fault him for that anymore. It’s a matter of survival. He did the best he could. We don’t talk anymore and I truly doubt he’ll see these words. I just couldn’t help but think of him as I wrote. I wish I could apologize for my immaturity. I wish I could apologize for not knowing how to help. Why am I sharing this with you all? I pray that somehow my words bring a little glimmer of hope, or at least a sense of camaraderie, to someone else who is fighting. I am surviving and beginning to see life again. You can too. I have been through hell and back, but I am still here. And maybe, (just maybe), I’m better off because of it all. Jaime, thank you for being open and vulnerable about the darkest places. Pain shared is pain lessened. I will raise my voice to say “yeah, me too”. Although my circumstances are different, the feelings of isolation and emotions like despair are extremely familiar. I’m glad you have a wonderful support system, I’m grateful that God is big enough to handle my temper tantrums and doubt and love me anyway. I’m grateful that things can and do get better if you can hold on for the miracle. Small ones at first, baby steps, but it can be done. You’re already on the right track taking care of you. There is after all, only one. You are original and have a profound effect on those you don’t even know, yet especially on those you do. I wish you well on your journey of finding yourself again. I’m doing that and finding who I was and who I am are not the same. That’s ok. I figure I’ll like me in the end. Peace. Thank you for writing this. I work at Wheaton and I live with PTSD and I have experienced similar struggles with anxiety and living/working in community. The silent screaming and the strategizing are so familiar. I know it is difficult to express how mental illness impacts our lives, especially in Evangelical communities. I’m so thankful your family is supportive and helpful, what a gift! Thank you for sharing your story, I know it will be helpful to many.